When I was a lad, I was a keen racing cyclist, but my favourite sport was cyclo-cross, and in the 70s the highlight of the year for me was the annual 3 Peaks Race held on the last Sunday in September. This was a 25 mile race, open to amateurs & professionals, with about 20–22 miles rideable and 3–5 miles running/ walking/ staggering/ falling, dependent on individual ability & prevailing conditions. It included 5000’ of climbing and descending. The race started at Horton-in-Ribblesdale, proceeding on road to Ribblehead Viaduct, then by tracks up and down Whernside 2419’, with a road stretch through Chapel-le-Dale then left onto the track to Ingleborough 2373’. It was possible to cycle across the plateau at the top, then there was a steep descent before joining a rideable track to Selside, back along the road to Horton and left up a rough track for the final climb up Pen-y-Ghent 2273’. Most of this was rideable, with a hair-raising descent to the finish in Horton. I completed the race 7 times between 1970 and 1977, with 5 finishing places between 4th and 8th. In 1975, my wife Theresa, with Claire almost 3 and Catherine 7 months, managed to get to Ribblehead Viaduct with spare wheels. I punctured just before the viaduct, and dropped from 1st to last place before I got my wheel changed, but without Theresa’s help I’ld have been out of the race. I managed to get back up to 2nd place at the top of Whernside, and was still 3rd at the top of Ingleborough, but the chase had taken too much out of me and I finished 6th in 3:07:10, 15 minutes behind the winner. My best ever time was 2:56:15 in 1972, and I helped Keighley St Christophers/Bronte Wheelers win the team prize 5 times. In those days the race field was restricted, though 100 finished my last event in 1977. The event has now been extended to 38 miles, and 536 finished in 2015! In 1978 I decided to try the 3 Peaks running race instead. As Mel Edwards said in his article, conditions were atrocious. The course differed from the cycling route, and visibility was near zero on top of Ingleborough. I lost sight of the runner in front, and couldn’t find the path down to Selside. However I could see a clear descent to Clapham, so I ran down there with 2 other runners, even though I knew it was miles off-course. I managed to scrounge a beer at the pub, then hitched a lift to Settle. I don’t know what the other 2 did. I ran back from Settle to Horton and managed to get clocked in as a finisher in 4 hours 1 min. Like Mel I was dismayed to find out later that a runner had died, and thankful I’d decided to make a safe descent. Theresa wouldn’t ever hear of me doing the race again! 1977 was my last cycle race until 2006, when I started doing duathlons and time trials. After these endurance events, it was a natural progression through half marathons to the marathon, and my favourite race was the Inverclyde Marathon. 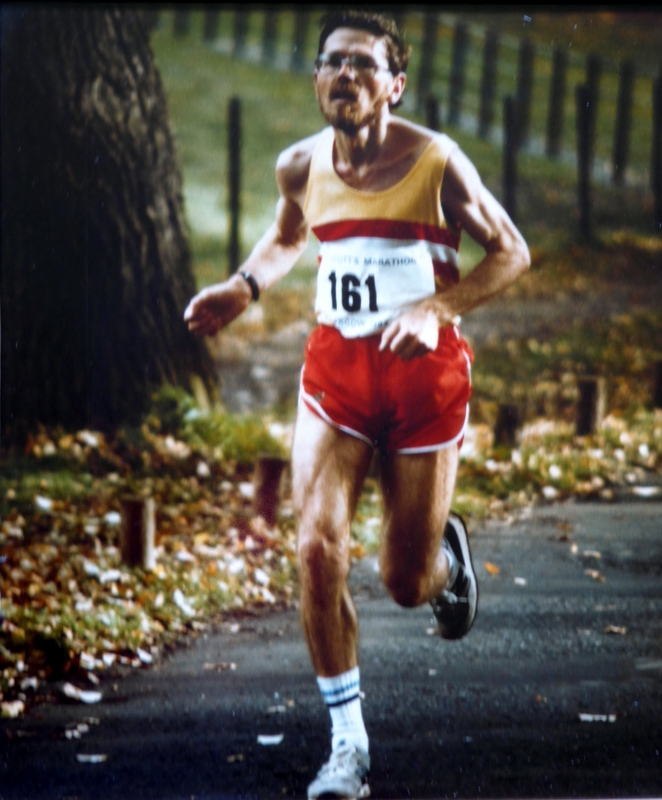 After ‘hitting the wall’ in the first event in 1981 (2:36:04, 13th), won by 50 year old Bill Stoddart in 2:27:43. I swore “Never again!”, but I ran the race 10 times all told, & a total of 40 marathons between 1981 & 2000. 1983 was my best year, starting with London, running in Greta Waitz’s group for 19 miles, before dropping back & finishing in 2:29:05. 4 weeks later I ran at Motherwell, finishing 2nd in 2:29:38. It was great having a police motor cyclist escorting me over the last few miles, and all the family cheering me at the finish. Then I had 3 months recovery before returning to the Inverclyde Marathon, finishing in 4th place with a PB of 2:24:49 at age 39, 2:24 behind winner John Stephens & 1:27 in front of Brian Carty. By then I had the marathon bug, and I ran Glasgow 2 weeks later in 2:31, followed 2 weeks later by the Humber Bridge Marathon, where I finished 6th in 2:31:42. All of these races were just preparation for a charity marathon relay starting at 6am on Sat 8th Oct 1983, when a team of 14 runners from Organon Laboratories Ltd (where I worked for 30 years) ran from Newhouse, Lanarkshire to the Organon HQ in Cambridge. Organon UK was celebrating 50 years in healthcare, and we decided to do this 376 mile relay in 14 stages to collect money for The Cystic Fibrosis Research Trust. As the most experienced runner, I volunteered to run the hilly 4th stage from Jedburgh over Carter Bar to Otterburn. We were blessed with perfect running conditions, and I managed 26.7 miles in 2:47. After my run I was given overnight accommodation with a family in Darlington, who had a child with cystic fibrosis. Then one of our support vehicles took me to Lincolnshire. On Sun evening we were relaxing in a pub near Lincoln, and I was on my 3rd pint, when the call came that our 11th stage runner was in difficulty, so I was pressed back into action to complete 7 or 8 miles of the stage through Lincoln. The beer must have given me wings, because I got to the changeover point, before the next runner was ready! I just kept running till the support vehicle got him up to me, then I was driven down to Histon, where all 14 runners (including the 14th stage runner) completed a final 4 mile jog to Cambridge Science Park, finishing at 13:31 on Mon 10th Oct. We collected over £5000 for our efforts, which Organon made up to £10,000, and it was a memorable team-bonding experience. I returned to Inverclyde in 1984 as a veteran and finished 3rd overall in 2:26:57, but was beaten by 1½ min by the indomitable Allan Adams. Allan beat me again in 1985 2:26:10 to my 2:27:24, when we were 1st & 2nd in the Scottish Veterans Championship. Brian Carty was 3rd vet in 2:29:28. John Stephens won again in 2:23:13. In 1990 I finished 3rd, & 1st vet, in 2:30:03. The absence of Allan & Brian made it a bit easier. In 1991 the race incorporated the Scottish Marathon Championship for the first time. I was feeling good and hoping to beat Charlie McDougall, but suffered a torn hamstring at the Inverkip turn. I didn’t fancy walking 7 miles, so started running again after walking briefly & managed to finish in 4th place, 2:23 behind Charlie. To add insult to injury, Charlie & I both had to undergo a drugs test after the race! I think we were allowed some beer to help us produce samples. First 4 finishers were T Mitchell (Fife) 2:24:50; J Stephens (Low Fell) 2:27:10; C McDougall (Calderglen) 2:35:51; D Fairweather (Cambuslang) 2:38:14, 1st Veteran. In 1992 I decided to try the Lochaber Marathon, which was the Vets Championship for many years. It was an inauspicious start, as I hit the wall after 15 miles & finished 13th, 11min behind Colin Youngson (2:36:23). I ran at Lochaber 8 times & it took 3 attempts before I got a grip on it, In 1995 I finished 4th & 1st Vet in 2:36:02, which I think was an M50 course record. John Duffy won in 2:31:19. In 1998 it was the BMAF Championship, and I had a memorable duel with Colin Youngson. After the turn I started putting in short spurts to try to open a gap on Colin, who finally gave up at 17 miles gasping “On you go you wee b—–!” I think it’s the only time I’ve beaten Colin in any race. Meanwhile Bobby Young had been watching us from behind, and started chasing me. I only just managed to keep going, & finished in 2:43:37 for my 2nd BMAF M50 title, with Bobby 2nd M50 in 2:43:58. M40 Mike Girvan won in 2:30:36. Although I had several disastrous marathons, where I hit the wall, I did manage to win 1 marathon from the front, without any problems. In June 1988 I ran the last Galloway Marathon. Although it was quite a strong field, I thought the pace was too slow, & everyone was watching me and nearly tripping me up, so I broke away after just 3 miles. I felt good & just kept going, finishing in 2:32:06, almost 5 minutes in front of Colin Kinnear from Dumfries, & broke the Vets’ course record by 13 minutes! 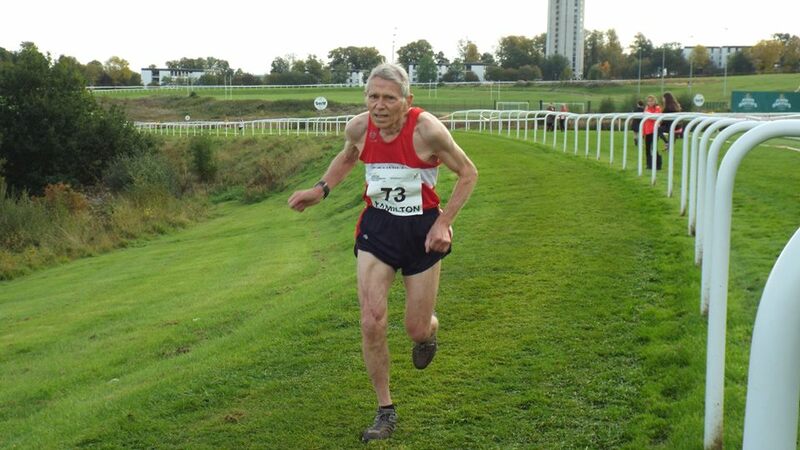 I’ve enjoyed cross-country races since my Uni days, & initially used them as training for cyclo-cross, but I never did a decent run in a major event until the SCCU Veterans Cross Country Champs at Musselburgh in 1987. Up till then I’d always been an also-ran, but that winter I had a week off work when our factory site was closed by snow. I took advantage of the break to do hard runs every day in the snow, & by 8th Feb I was at my peak…Brian Scobie led from the start, & it was a race for 2nd place between me & Brian Carty. I clung to him like a leech & we opened up a gap on the rest of the field. I knew I couldn’t outsprint Brian but I hung on till the last 200 metres & finished 10 sec behind Brian C & 38 sec behind Brian S. I claimed numerous scalps, including Archie Duncan, Colin Martin & Allan Adams. It was a 1-off performance & I never got any other medal in the Scottish Veteran Championships. Similarly, in the British & Irish Veterans/Masters Cross Country International, I’d managed to get a few team medals, & I did win an Open Race M50 prize at Malahide in 1995, but I was never near winning an individual medal until Navan in Nov 2000. I suppose I had a good build up, with 78:28 in the Helensburgh ½ Marathon, 2:48:39 2 weeks later in the Glasgow Marathon, & 78:48 3 weeks later in the Inverclyde ½ Marathon! Anyway, by the time I got to Navan I was well-prepared, but I fell flat on my face in the warm-up, which didn’t augur well for a good race performance. I’m never very good at judging my position in cross country races, and I didn’t see any M55 numbers, so just assumed that all the good runners were out of sight in front. Then on the last lap I passed Archie Jenkins (who was in the M45 team! ), and suddenly I was on Colin Youngson’s heels (ln the M50 team!). but he wasn’t going to let me beat him this time, & I crossed the line 3 sec behind him to win M55 gold. Frank Reilly came in 12 sec behind me, with Graham Patton 3rd a further 6 sec behind. With Bobby Young 4th & Brian Campbell 10th we won team gold as well. I’ve managed a few more team medals since then, but been nowhere near another individual medal.